Movie culture has this ability to sneak inside your veins and psyche, putting ideas and images from movies you have never even seen inside your mind. I missed out a lot of good movies, but I can even this up with a lot of bad movies I have not seen, the new “Tron” movie being one of them. Nevertheless, a brief glimpse on “Sci Fi Music” by the duo of Cyclotimia has immediately surfaced the movie in my mind, as my eyes caught bright bluish lines and grids that pierce an empty, black space. Not the old Tron movie, mind you, but the new one. Wild associations aside, “Sci-Fi music” is indeed described as “Soundtrack to a nonexistent movie”, which disqualify Tron from being an inspiration, fortunately, yet keeps us in the realms of futuristic cinema as far as the idea for the album goes. The sixteen chapters of the album hold instrumental electronic music with different themes to them, as a real movie score should be. The sounds, synth based or computer generated, and even, at points, adorned with what sounds like acoustic percussion and bells, sheds a veil of mystery and vague understanding of what the storyline is. The album begins with “Battlefield”, which sounds like a fast forward version for Peter Murphy’s song “All night long”, yet with a futuristic sound to it. The opening track gains speed and a tense, warlike atmosphere to it, as MK and LM of Cyclotimia attempt to help the listeners visualize the beginning of the movie they are not watching. Other moments, like the fifth track – “Base”, are more minimal and flirt with IDM and Glitch music while delivering the right mood for the overall work of the album. Other moments are weaker, like the following track – “Time and Space”, which, in my opinion, tries a little too hard to illustrate its title, as tiny, harp-like sounds are manifesting an expanding volume of space. 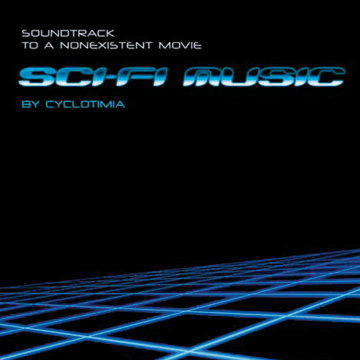 However, Cyclotimia offers a wide variety of musical energies, from intense tracks to more minimal ones (another minimal track is “Quiet night”, that I really liked) and thus makes “Sci-Fi music” a very dynamic, constantly changing album. “Sci-Fi Music” serves as a good glimpse over the work of Cyclotimia, and this project has lots of work to listen to, including some other interesting looking theme albums. I think that out of their discography, my favorite is going to be their 2008 album – “Music for stockmarkets”. You can’t lose with this one.